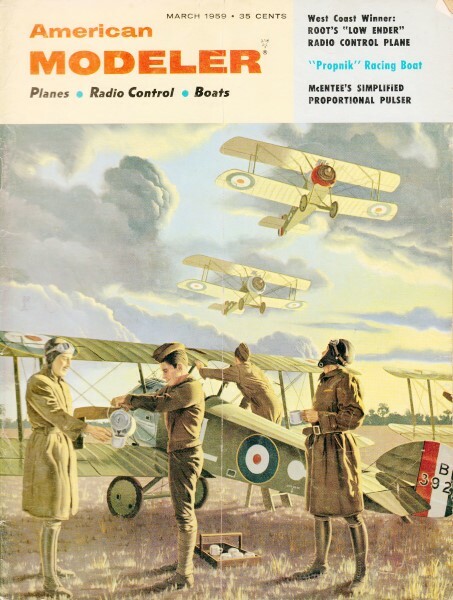 Less than two years before this issue of American Modeler went to print, the Russkies launched the first Sputnik orbiting satellite. The Space Race was on, and America was scurrying to show the Commies that we could out-do them. It wasn't until August of 1960 that NASA finally launched Echo, but after that the rest, as they say, is history. That bit of background is needed to understand the creation of the name 'Propnik' by Bill Baughman for his air boat. This is a free running or tethered model that uses a Cox Babe Bee .049 for power. I've always liked air boats, and in fact my very first radio controlled model was a crudely built air boat using an .049 engine and rudder-only control. The Propnik is a much nice boat than my hunk of foam. First we were startled by "Sputnik," then along came "Muttnik," now we come up with a sea-going satellite dubbed "Propnik!" Laugh if you will, something like this full size could be developed into an efficient high-speed commuter vehicle. 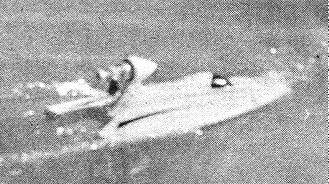 Definitely something different in model boats, this reverse sponson air-prop hydroplane features top performance at small cost. A Cox Babe Bee or similar small bore engine that can be set up to push will give you all the speed you can safely handle in a boat this size. If you have the room, by all means run "PN" free, using rudder to control turns. Should your boating site be small or have concrete walls, better use a tether pole and light Nylon fishing line to keep 'er in one place and in one piece. Provisions for either mode of operation are contained in the design. If you are ever going to have the fun of running the thing, you must first build it, so let's get started. As all com­ponents attach to the hull base sheet, prepare the balsa for that part first by edge-gluing 1/4" sheet, or double 1/8" sheet cross-grained, of sufficient length and width to take the pattern. Trace lines to assembled sheet and cut out over-all shape and pylon slot, sand all edges smooth and true. Using the plan deck view, a ruler and pencil or pen, layout positions of all ribs and formers on hull base sheet. Cut out the side deck formers, main hull sides, ply pylon, balsa pylon cheek pieces, braces, and transom. Make sure hull base sheet lies flat. If any warp is noted, pin float to building board until most deck forming is completed. Cement the two main hull sides in position, cutting and fitting the 1/8" balsa formers where shown. No patterns for these are given as they are all 1 3/4" wide, a flush fit at top of .side pieces. Install hardwood transom, 1/4" square pylon braces, and 1/8" balsa sheet doublers in position around pylon slot, making sure slot is clear at all points. While assembling the pylon, motor mount, and pylon cheeks as a unit, you can be cementing the eight side deck formers and 1/8" square deck braces in position. As to the pylon, the ply pieces fasten with Elmer's or Weldwood glue and two flat head screws. The balsa cheeks are rough-cut to shape, finished with sandpaper after gluing to pylon sides. If engine other than designated Babe Bee is to be used, be sure engine mounting holes will fit motor mount shown. If necessary to use larger diameter mount unit, provide for that change now. Try the pylon unit for fit in slot, glue when fit is secured. You will note all slot cuts are 1/4" wide so pylon cheek pieces must trim to slot edges. Check for true vertical alignment of pylon and hold with Scotch Tape if necessary; let dry over night. Install front tether insert, if desired, and proceed with planking. Using 1/2" strips of 1/8" sheet for side decking and doing both sides at once, this will go quickly. You will find some edge trimming necessary due to deck crowning. The main hull decking is best done with two pieces of 1/8" sheet, fitting each around pylon. All decking strips must be feathered at angle with sandpaper at point of contact with hull base sheet. As decking progresses, you will note that the stern area between the two rear sponsons will be unfinished and have an open space on either side. 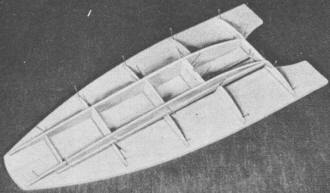 From scrap balsa, fit the stern cheek pieces, cement, and then trim decking to curve of hull base sheet. An over-all finish sanding to designed shape completes this operation. Things can now start to wind up fairly fast as you can work on several parts simultaneously. Glue up some of the 1/8" sheet to make the forward sponson and after sanding to shape, cement to underside of hull. Cut rear sponson sides per plan outline, cement in position making sure the 3/8" square parts are located at outside edge of hull. These are also made of the 1/4 " and 1/8" scrap. Insert the 1/8" sponson formers and when set up, plank each sponson. This is best done with grain running across sponson. You may find two courses of 1/16" sheet easier than the one 1/8" covering. Forward edge must be sandpaper feathered for neat fit at hull bottom. To complete rear sponsons, sand covering smooth and flat, mark off a line 1/4" in from outside edge and with sandpaper on a block, sand in the non-trip bevel shown in typical framing section. In the meantime, gather up more scrap 1/4" and 1/8" and glue up the rough blank for shaping engine streamline pod. Sand shape bottom area to fit pylon cheeks, rough sand remainder to shape and glue to ply motor mount. Sand pylon area above deck to streamline section, finish sanding motor pod to shape. After gluing up additional 1/4" stock, rough-cut driver compartment pod, sand to finish shape, hollow interior for lightness and cement to main decking. If you plan to let your boat run free, drill rudder post hole in transom, cut out rudder, solder in head slot of mounting bolt, install in hole when painting is completed. If .you must use tether, place small screw-eye in front hardwood location, drill holes and temporarily mount motor unit in position. Tie light string to front screw-eye, make large loop in other end, place loop around pylon. Hang boat up on this temporary bridle, move rear loop along pylon until boat hangs level in all directions. Mark position on pylon and insert other screw-eye at that point. Motor unit should be removed for final work of sanding and painting. Getting back to just the boat once more, sand and paint to your satisfaction. Using Aero Gloss sanding sealer for a smooth base, followed by their spray can fuel proof dope can get you on the water in no time. Just be sure to use a fuel proof material and put on enough coats. Decals and other trim may be added if you want to doll it up. Now make final motor installation, attach rudder or tether line, and be prepared for some spectacular action. As a word of caution, better start with engine running rich until you get used to this job, leaned out it has a rather rapid "orbit". 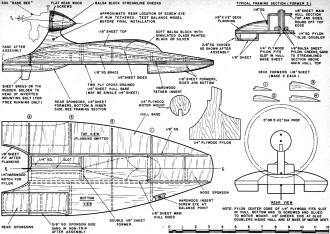 Materials List: 3 sheets, 1/4" balsa sheet, 3" wide for Hull base sheet, pylon braces, driver compartment, rear sponson side formers, motor pod. 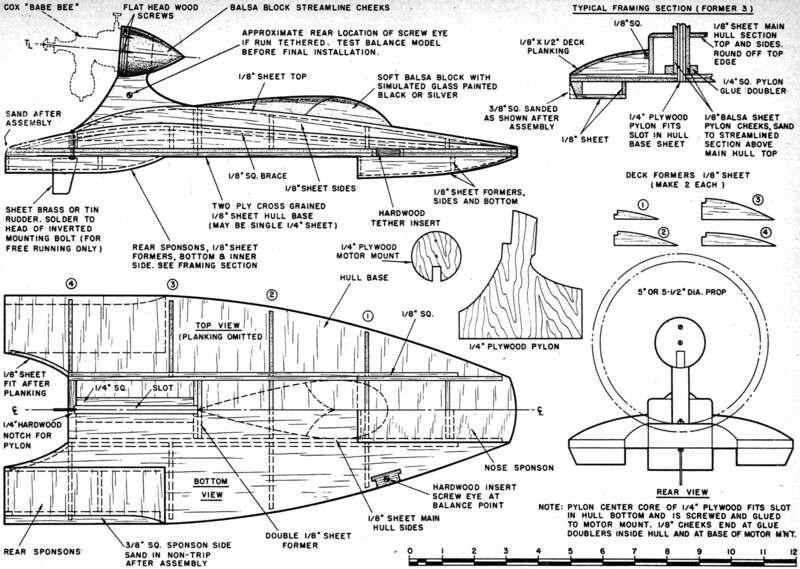 Three sheets, 1/8" balsa sheet, 3" wide for main hull sides and formers, side deck formers, all decking and decking braces, pylon cheeks, Nose and rear sponson side formers and covering, motor pod, rear cheeks. One piece 1/4" plywood, 5" x 6" for Pylon, motor mount, forward tether insert, transom. Fuel proof cement; Elmer's or Weldwood Glue; Pins; Scotch Tape; Sandpaper; two 1/2" F.H. Wood Screws; Knife; Saw; 1" x 1 1/2" piece Brass or Tin for Rudder; 2 small Screw-eyes, one 1 1/2" Perfect Mounting Bolt, Nut and Washers; Cox Babe Bee .049 Engine; 5 1/2" propeller; Engine Mounting Screws; Sanding Sealer; Fuel Proof Finishing Material.